Buried Movie Trailer. Ryan Reynolds stars in the hostage thriller. Watch the movie trailer for Buried below. Paul Conroy (Reynolds) is an American truck driver who has been contracted to work in Iraq and captured by insurgent guerrillas who intend to hold him hostage. Trapped underground with a limited supply of air, Paul frantically calls his family, his employer, and American military and political representatives, trying to remain calm as his chances of survival slip farther away with each passing minute. MPAA Rating: (R) for language and some violent content. 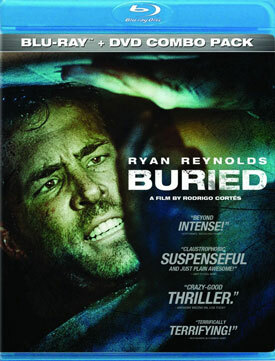 Paul Conroy (Ryan Reynolds) is not ready to die. But when he wakes up 6 feet underground with no idea of who put him there or why, life for the truck driver and family man instantly becomes a hellish struggle for survival. Buried with only a cell phone and a lighter, his contact with the outside world and ability to piece together clues that could help him discover his location are maddeningly limited. Poor reception, a rapidly draining battery, and a dwindling oxygen supply become his worst enemies in a tightly confined race against time — fighting panic, despair and delirium, Paul has only 90 minutes to be rescued before his worst nightmare comes true.